Doleman played as a linebacker and DE in college and was chosen by the Vikings in the first round of the 1985 NFL draft. Initially utilized as an outside linebacker, he was shifted to defensive end in a 3-4 alignment, making the most of his strength and speed as a pass rusher. He registered 11 sacks in 1987, earning his first Pro Bowl berth. Foleman followed up with 8 sacks in ’88 and another Pro Bowl selection. Vikings went 10-6 to finish first in the NFC Central while leading the NFL in sacks (71) and fewest passing yards allowed (2501). Lost NFC Divisional playoff to San Francisco 49ers (41-13). Doleman dropped to 11 sacks in 1990 and 7 in 1991. He bounced back to 14.5 sacks in 1992. Following a 12.5-sack year in ’93 he was traded to the Atlanta Falcons. Unhappy in Atlanta, Doleman recorded 16 sacks in two seasons before moving on to the San Francisco 49ers as a free agent in 1996. He improved to 11 sacks and four forced fumbles in ’96 and followed up with 12 sacks in 1997 and 15 in 1998. 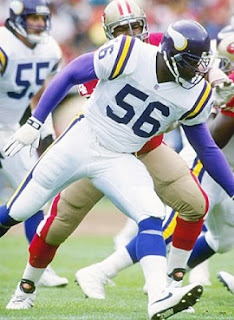 Doleman returned to the Vikings in 1999, recording 8 sacks in his last season at age 38.Overall he was credited with 150.5 sacks, 96.5 which occurred while with Minnesota. Doleman was a consensus first-team All-NFL choice twice and was chosen to eight Pro Bowls. Doleman was inducted into the Pro Football Hall of Fame, Class of 2012.